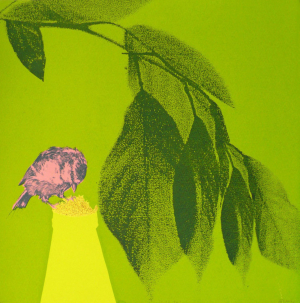 Anna has been working as a printmaker, illustrator and image-maker for 20 years since studying Fine Art in Bristol and Communication Design at Central Saint Martins. She now draws at home and makes prints at Spike Print Studio, Bristol, working with household paints, biros, fine liners, pencil crayons and screen print. Most of her prints begin as biro and ink drawings in her sketchbook which are then are developed into collages, and later become screen prints. Anna makes surprising, sometimes humorous or alarming images by combining mundane objects and environments with exotic creatures and characters. Pinpointing a specific moment in time, she is often drawn to objects from her childhood such as 70s televisions, radios and cars which all feature heavily in her work, as do urban and suburban landscapes. Anna loves architecture, particularly Victorian and contemporary brutalism, a combination of the two echoes most of the places she has lived; Liverpool, London and Bristol. "My main concerns are detail, specific drawing, surprising colour, composition, and believable storytelling. I love the craft of drawing and think it is more important than ever in our fast-paced digital age - to take time out and observe carefully."